Marinara sauce is so versatile. However, what comes in a jar is often laden with corn syrup, salt, and other foreign ingredients. This is the time of year when garden-fresh tomatoes are plentiful! Use them to make your own marinara sauce! It can be frozen or stored for up to 2 months in the refrigerator. And all it takes is a few SIMPLE ingredients. Tomatoes contain large amounts of lycopenes, carotenoid antioxidants that can aid in cancer and heart disease prevention. It has been found that organic tomatoes and tomato products contain even more lycopene than their non-organic counterparts. Look for deep red tomatoes for the highest concentrations! In a nonstick skillet, heat oil over medium heat and add the garlic. Cook just until fragrant, stirring approximately 1 minute. 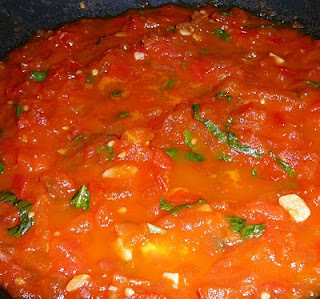 Add the tomatoes, sugar, basil sprigs, and salt and bring to a simmer. Reduce the heat to medium low and simmer, stirring often, until thick (~30 minutes). At the end of cooking, add chopped basil and salt or additional seasonings to taste.